Tsvetnoy Central Market is a high-end shopping mall located in the heart of Moscow, one mile north of the Kremlin; it opened in December 2010. Above and below: Upper floors of Tsvetnoy Central Market clad with EXYD-M panels (Photos Chris Gascoigne). Lifschutz Davidson Sandilands Architects, in cooperation with Ford McDonald, designed the upper floors of the complex. 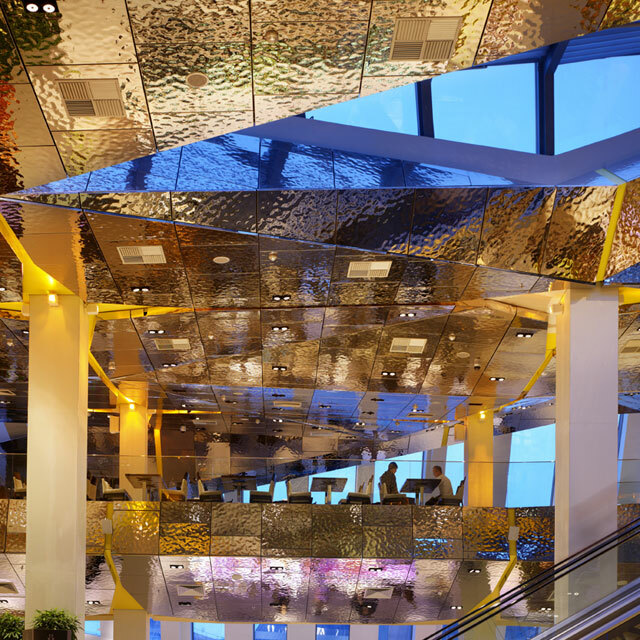 For their spectacular ceiling and wall concept they chose a surface developed and manufactured by EXYD. The Society of British Interior Design honored the work with the Best Interior Design Award 2011. 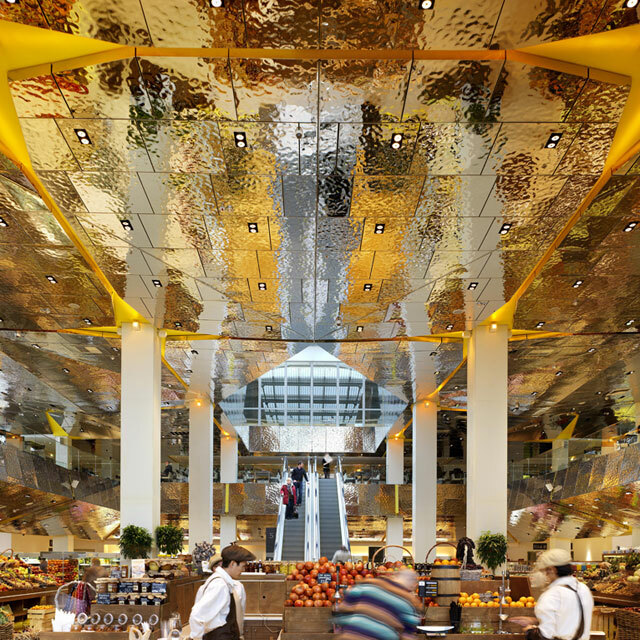 The EuroShop RetailDesign Awards 2012 for the three best store concepts worldwide went to Shanghai, Munich and to Tsvetnoy Central Market. EXYD produced in Germany 2,600 stainless steel panels with 1,600 different shapes ready to fit in positions including all recesses for components. More than 20,000 sq ft are clad by these panels. The surface, which was used for this project, reflects a fragmented image of the surroundings. 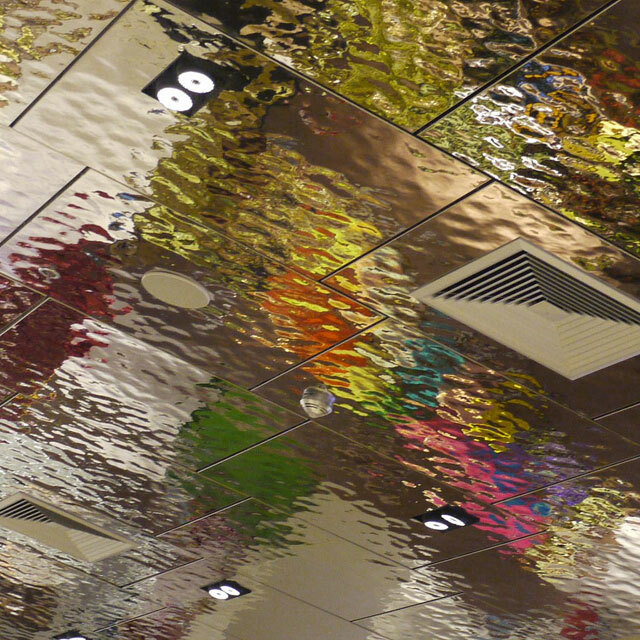 The surface was developed by EXYD in 2009 and is called Type EXYD-M.
EXYD focuses on surfaces – the products can be adapted for use with existing ceiling and wall systems. Product Line EXYD-M is available among others as fully integrated component of the ceiling program Lindner Lunar – Living Ceilings. In this project Lindner designed the substructure and mounted the panels including the substructure.